TIP: Make sure you read all the way to the bottom because we’re giving away a copy of this hot commodity! A grill in the backyard, filling the air with sweet and savory smoke foretelling of delicious meats, veggies, and more to eat has been a staple of summer in our families. That being said, at our house, grilling is a year-round cooking option. We love to grill our food, whether it’s hot and sticky or cold and dry outside or anywhere in between. Just thinking about a grill makes me drool. We couldn’t wait to get a copy of Paleo Grilling by Tony Federico and Chef James Phelan (with a forward by Amy Kubal). Published earlier this summer, this book is the perfect compliment to any bookshelf of healthy cookbooks. Did you get yours? If not, keep reading—we’re going to give you a shot to win a copy! As it’s full title, Paleo Grilling: A Modern Caveman’s Guide to Cooking with Fire, suggests, this book is much more than another collection of paleo recipes. It’s truly an introduction and guide to grilling. Tony and James start the book with a brief history of cooking with fire and of the relationship between man and meat. Following is a picture-rich guide to getting started with grilling: tools, accessories, and even a beautifully illustrated guide to meat cuts (courtesy of our friend Alex Boake!). We love the balanced approach Tony takes. Paleo Grilling provides some flavorful sauces, season mixes, starters, and sides. Next, he brings in a wide variety of main dishes, from ground beef to fish, veggies to wild game. For the sweet tooth he even has a few dessert ideas. Yes. I said dessert. In a grilling book. The recipe that stood out to us the most was the Fat-Burning Lamb Chops. The seasoning combinations were rich and flavorful, and the recommended cook time was spot-on. Lamb can be less forgiving than some other meats, but this recipe made it easy. Perhaps the most exciting thing about this book is how approachable it is. With practical tips, easy to follow recipes, and some fun facts about cooking with fire, Paleo Grilling makes firing up the grill fun and easy for even the novice. So, go on. Heat up your summer (or fall, or winter, or spring!) with tasty grilling treats from Paleo Grilling! 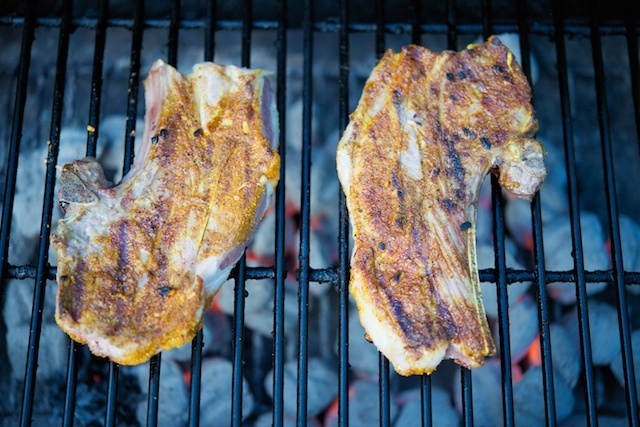 BONUS: Tony was kind enough to grant us permission to share the Fat-Burning Lamb Chops recipe! Check it out, and then buy your copy or enter our giveaway to win one! 1. Mix all of the spices together in a bowl. Dip the lamb blade chops in the spice mixture to coat both sides. Reserve the remaining spices. 2. In a saute pan, melt the coconut oil over medium heat. Add the reserved spices and cook for 1 minute while stirring. Deglaze the pan with the white wine and bring to a boil. Reduce the heat and cover. 3. Preheat the grill to high heat. Place the lamb on the grill and sear both sides, about 2 to 3 minutes per side, or until the desired doneness (145°F [63°C] for medium-rare, 160°F [71°C] for medium, and 170°F [77°C] for medium-well). 4. Drizzle the lamb chops with the sauce and serve. Note: This recipe was contributed to Paleo Grilling by Abel James of The Fat-Burning Man. I have a few. When I was little I remember my grandmother would throw big feasts and they would buy a whole pig and slaughter other stuff like a chicken and duck or rabbit and they would smoke and grill. It tasted do good! Though I always cried because my pets were constantly dying. 😦 another was grilling in England with my mom and step dad, she made great pork steaks. The whole neighborhood smelled amazing. We had a pretty garden and we would relax and enjoy our selves as a family outside. I loved the smell of my dad grilling all summer as a child. Unfortunately he liked to char his meat till the type and cut were unrecognizable. I think the only meat I could identify were tbones (because of the bone) and chicken (because he would coat it in some god awful sauce). But it always smelt great!